Gun sellers say they expect more sales of semi-automatic rifles and possibly gun safes since voters said yes to Initiative 1639. But it’s too early to know just how significant the increase might be. The phone at Wade’s Eastside Guns started ringing at 8:30 a.m. the morning after the election. Starting next year, Initiative 1639 will raise the purchase age for semi-automatic rifles to 21, the age currently required for handgun purchases under federal law. People buying semi-automatic rifles will be required to pass an enhanced background check, prove they have taken a firearms-training course and wait 10 business days to take possession of the gun. The initiative also authorizes the state to require gun sellers to add $25 to sales of semi-automatic rifles to fund the new regulations. A “safe storage” provision makes it possible that gun owners could face criminal penalties in some instances if their firearms are accessed by someone who is not legally allowed to have them, like a child or felon, and who then causes the gun to discharge or uses it in a crime. The provision doesn’t apply if the gun was secured with a trigger lock or similar device or if the owner had reported it stolen within five days of the theft. 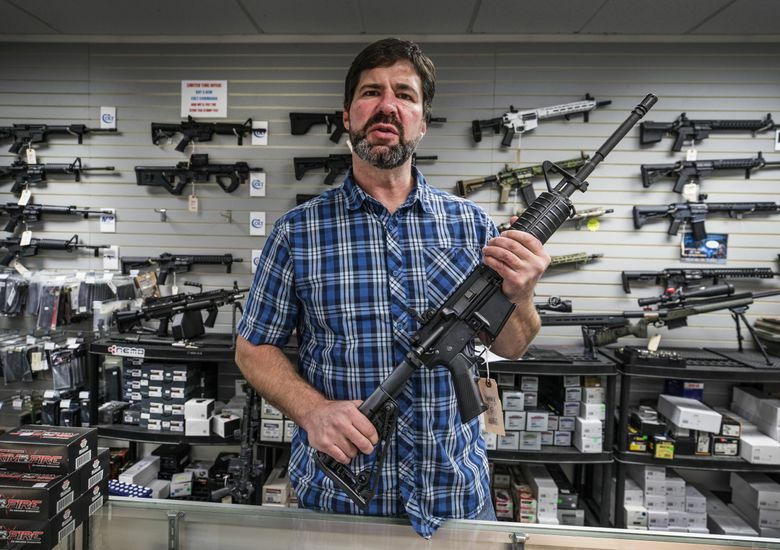 Gun sellers who spoke to The Seattle Times said they expect an increase in sales of semi-automatic rifles and possibly gun safes, but it’s too early to say just how significant that increase might be. “We have seen an uptick in sales since the passing of the law and expect it to continue,” Jody Lewis, owner of Rehv Arms in Covington, said in an email. Tallman Trask, a spokesman for the Alliance for Gun Responsibility, which advocated for the initiative, said his organization acknowledges that new regulations can sometimes lead to increased sales but argues I-1639 will not lead to any “onerous restrictions” on gun purchases. Gun dealers said they’re also awaiting clarity from state regulators on certain elements of the new law, including the training requirement. Gaughran said his store may develop a “quick test” to administer at the counter or online. The law states buyers must show they’ve completed a “recognized firearm safety training program” in the last five years that covers issues like handling, storage and suicide prevention. The training must be sponsored by a law-enforcement agency, college or university, nationally recognized organization or firearms training school, according to the law. Whatever uptick in sales local gun sellers see from I-1639 could be tempered by national trends. Nationwide, the election of Donald Trump had reportedly caused an ongoing slump in gun sales. Jason Cazes, owner of LowPriceGuns.com in Bellevue, said he increased his inventory in anticipation of a Hillary Clinton presidency. Information from the AP and The Seattle Times archives was used in this report.